Lexus CT200h hybrid prices | What Car? Lexus has revealed pricing and specifications for its CT200h hybrid. The CT200h will be available in three trims: SE-I, SE-L and SE-L Premier, with the entry-level SE-I costing from 23,485. Running costs should be low thanks to the hybrid powertrain, which gives an average of 68.9mpg and produces just 94g/km of CO2. This makes the Lexus exempt from VED road tax and gives it a company car tax rating of 10%. 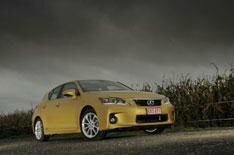 The Lexus CT200h is available to order now, with first customer deliveries early in 2011.